DVIGear, a manufacturer of digital connectivity products, is exhibiting its comprehensive suite of end-to-end 4K (UHD) video distribution solutions at InfoComm Connections in San Jose, CA on March 4-5 at Booth 401. DVIGear will also demonstrate a preview of its new uncompressed AV over 10GbE technology at the show. At InfoComm Connections San Jose, DVGear will exhibit a complete range of 4K video distribution solutions designed and built to overcome the challenges of transporting signals at the high data rates required by 4K video. 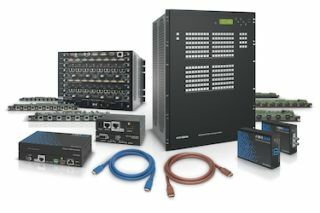 DVIGear's MXP Series matrix switchers are non-blocking cross-platform switchers that are completely modular. Several frame sizes are available enabling I/O arrays from 8x8 up to 80x80. Using a high-speed digital routing engine, the MXP Series can support 4K / 30p signals simply by installing the available 4K I/O cards shipping since 2013. These cards are field-proven and are capable of routing 4K signals over fiber, twisted pair, and copper connections. DVIGear will also show the DVI-3580a supporting scaling and multi-viewing of video signals up to 4K / 30p. DVIGear will also exhibit a wide range of 4K video signal extension technologies. Among these are DVIGear's long-reach copper cables, CAT-X twisted pair extenders, and fiber optic extenders. The SHR™ Series HDMI and DVI copper cables support 4K / 30p up to ~25 ft. (7.5 meters), while the HR Series DisplayPort cables support 4K / 60p up to ~50 ft. (15 meters). Several twisted pair extenders are available that use HDBaseT technology to extend 4K / 30p up to 330 ft. (100 meters). DVIGear's DVI-7520 and DVI-7525 are provide a simple, cost-effective way to extend uncompressed video, audio, IR and RS-232 as well as Ethernet all over a single CAT-X cable. These HDBaseT extenders fully comply with the POH standard to extend remote power from the transmitter to the receiver, simplifying installation. For applications that require extreme distances, DVIGear will display an unmatched range of high-end fiber optic extension solutions. Among these, the DVI-7313 and DVI-7314 support 4K / 30p extension up to 500 meters over multi-mode (DVI-7313) and 2 km over single-mode (DVI-7314). These extenders use a cutting-edge SerDes that enables high-speed signals to travel over a single fiber optic cable. DVIGear believes that while AV/IT convergence is quickly approaching, many of the current products on the market are plagued by the problems of using high levels of compression to transmit these high-speed signals. They simply cannot deliver the quality and consistency required by high-end installations. This is about to change. At InfoComm Connections in San Jose, DVIGear will show a preview of its game-changing new uncompressed AV over 10GbE technology. This demonstration uses off-the-shelf 10GbE switchers to route uncompressed 4K signals to multiple destinations. The artifacts and latency visible with compressed video over IP have been eliminated. Using 10GbE network architecture offers greater flexibility, scalability, and is more cost-effective than traditional AV matrix switchers while offering pixel perfect quality. The future of AV distribution is coming soon.